Background: The widespread applications of sulphonamides, as antibacterial or antimicrobial agents, and their mechanism of actions in the body, have changed their determination to an important issue in the area of human health. 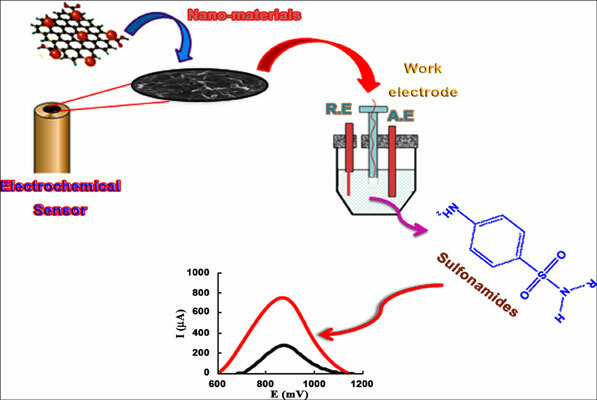 Objective: Here, history of developing voltammetric sensors based on nanomaterials for the detection of sulfonamides including sulfadiazine, sulfamethoxazole, sulfacetamide, sulfadimethoxine, sulfathiazole, sulfamethiazole and sulfamerazine is reviewed. Modified electrodes based on various nanomaterials (carbonaceous nanomaterials, Metallic Nanoparticles (MNPs), conducting nanopolymers) have been reported, and studies showed that nanomaterials have been mostly used to overcome problems like the poor sensitivity and selectivity of bare electrodes. The study covers the properties of each sensor in detail, and reports and compares the linear ranges, Limits of Detection (LODs), reproducibility, and reusability of the electrodes reported so far. Sulfonamides, voltammetric determination, modified electrodes, electrochemical sensors, nanomaterials, electrochemical methods.